MP Blaine Calkins pins a Queen's Diamond Jubilee Medal onto Tina Mix. Mrs. 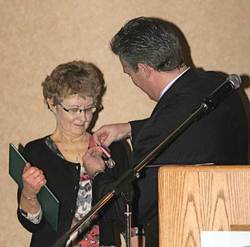 Mix was presented with the honour at the January Leduc Regional Chamber of Commerce Luncheon for her varied and ongoing contributions and volunteer work that has helped make Leduc a wonderful area to live in. Leduc County and City Mayors Whaley and Krischke respectively, nominated Mrs. Mix for the medal.